Since we have a frost delay today, I thought I would post some information on frost and frost delays. No one likes frost delays - maintenance workers especially - but they are necessary for the health of the course. 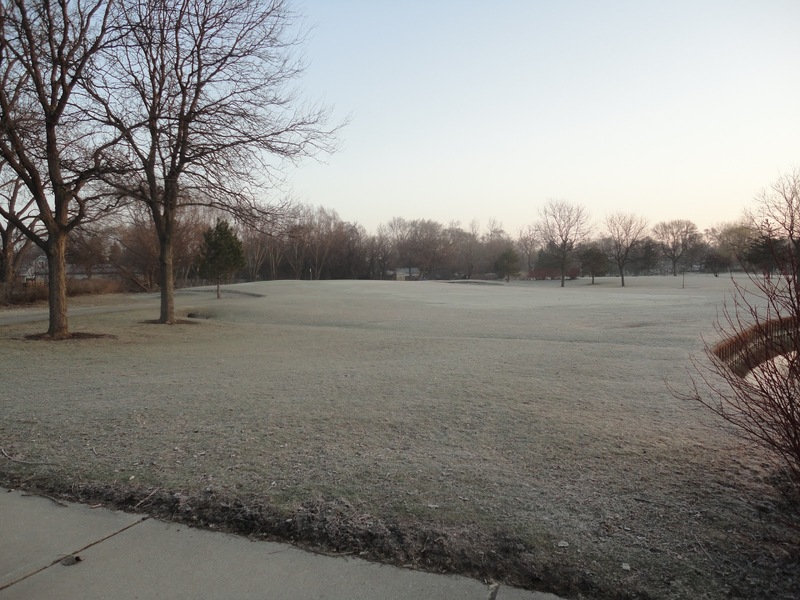 Golf course employees ask for your understanding during frost delays. We don't like them either. 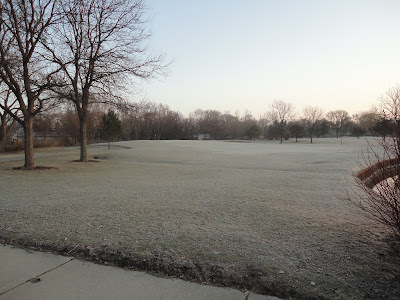 • Frost is basically frozen dew that has crystallized on the grass, making it hard and brittle. A grass blade is actually 90 percent water, therefore it also freezes. • Walking on frost-covered greens causes the plant to break and cell walls to rupture, thereby losing its ability to function normally. • When damaged, the putting surface weakens and becomes more susceptible to disease and weeds. • One foursome can leave several hundred footprints on each green, causing extensive damage. • A short delay while the frost melts can preserve the quality of the greens and prevent needless repairs. You can find a more detailed article on frost formation and effects in this article - "The Big Chill"
Good Winter or Bad Winter for Turf? The maintenance crew also sodded some areas that we know from experience will take a long time to fill in with seed alone. This should speed up the grow-in time. Most of the areas injured over the winter have filled in or are greatly improved. These few stubborn spots needed some sod. With a little more sun and heat, the rest of the seeded areas should fill in quickly. Last week, the maintenance crew installed new yardage markers on the course. The five par 4's are marked down the middle of the fairway every 25 yards from 200 yards out to 75 yards out. We measured the center of the green back to front and left to right. Remember that the markers go to the center of the green, not necessarily the pin location. For pin locations, a red flag means the hole is in the front third of the green, a white flag indicates the middle third, and a blue flag means back third. We hope having more visible yardage markers every 25 yards instead of every 50 yards will make it easier to find your distance to the green and lead to more enjoyable rounds at Sugar Creek. Last week we saw a duck that looks different than any other duck we've seen at Sugar Creek. After a little research, I think it is a hybrid between a Mallard and a Muscovy duck (that would be Anas platyryhnchos x Cairina moschata). If there are any duck experts out there, please let me know if I'm on the right track. Whatever it is, it's an interesting looking duck with nice green and blue colors in its wings. Check out the pictures below. You can click on the picture for a larger image. If anyone has any information on this duck, please let me know. Soon dozens of species will be in bloom around the clubhouse and golf course. Our reward for making it through another long winter!